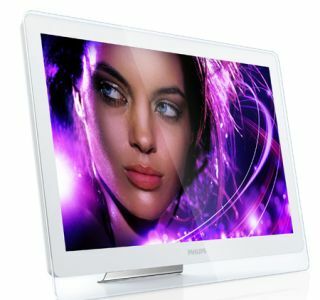 IFA 2011: Philips turns on the style with DesignLine range of tilting TVs | What Hi-Fi? If you're all about style and are looking for a TV to compliment your living room decor, look no further than Philips' new DesignLine range of LCD/LED tilting TVs. Philips calls it "a fusion between function and form" and with its Apple-esque design and glass frame, which gives the illusion it's floating mid-air, we're inclined to agree. There are two models – the Edge (above) and Tilt TV (below). The 32 and 42in Edge models pack in most of Philips’ recent TV technologies including Ambilight, as well as Full HD and 3D. The set tilts back six degrees for varied angle viewing. One of the highlights is the Easy 3D technology – a variant of passive 3D. So, you only need cheap polarised 3D glasses instead of expensive battery-operated active ones. The Edge also has its own matching SoundHub, which features the same tilting mechanism as its telly counterpart, complete with titanium tweeters, ensuring it stays in line with its stylish aesthetic. With Full HD 3D Blu-ray, built-in wi-fi, video-on-demand services from Smart TV and a built-in dock for your iPod/iPhone, the SoundHub home theatre sounds like the perfect accompaniment. Shame it's sold separately. On the flip-side, the Tilt – available in 26 and 22in flavours – comes minus the Ambilight tech, but lives up to its name with its ability to tilt back a full ten degrees for your viewing pleasure. Unlike the Edge, it's HD-Ready rather than Full HD, hides away two HDMI ports and packs an integrated MPEG-4 tuner for HD reception without a set top box. And with a Digital Crystal Clear processor, it tries its hardest to digitally adjust and optimise picture quality to offer the best contrast, colour and sharpness levels. Philips hasn't given us a release date, as such, but has said it will be available from John Lewis imminently.